News | Aurora Multimedia presents the only encrypted 4K60 4:4:4 10Gbps AV over IP transceiver | Aurora Multimedia Corp. | Lowrance Sound Company, Inc. 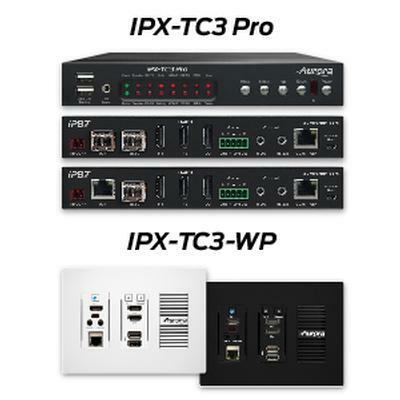 The IPX-TC3-Pro provides one of the most advanced IP Streaming solutions on the market utilizing Auroras IPBaseTTM technology, which synergizes various IP/AV standards to work together as one. Aurora Multimedia presents the only encrypted 4K60 4:4:4 10Gbps AV over IP transceiver, utilizing their Patent Pending IPBaseT® technology based on the BlueRiver NT+ platform. The IPX-TC3 compliments the growing line of IPX Series 10Gbps products. Aurora is changing the topology of AV, improving reliability, serviceability, scalability, capability, and inventory management. The IPX-TC3 is the World’s First 10Gbps IPBaseT® transceiver capable of 4K60 4:4:4 with a frame latency of only 100us (.1ms) offered in copper and fiber. The IPX-TC3 is the first ever 10G SDVoE product to have redundant fiber version and selectable copper fiber in a single unit. Aurora is also the first company to utilize PoE with 10G and has worked with Ethernet switch companies to develop and ship 10G PoE switches paving the way for cleaner installations. Aurora’s latest combines a variety of IP technologies and features under one unified protocol using a simplified topology. Seamless switching, USB 2.0 (480Mbps), Dante®/AES67 8-channel (another Aurora first), 1Gbps Ethernet, and control are some of the core capabilities of IPBaseT®. The IPXTC3 also supports dual OSD (On Screen display. This allows for content to be generated at the encode and decode sides. Powerful hardware needs powerful software to compliment. The IPBaseT® Manager allows full set up and control of all functions. Key features are the EDID editor allowing for full manipulation of an EDID to create common denominators and Rapid Deployment Tool (RDT) which can fully configure a large system in minutes. Utilizing the bandwidth of a standard 10Gbps copper or fiber, the IPBaseT® IPX Series supports large scalable audio/video matrixing, and it does so while replacing multiple technologies and products with a "single-box" distributed platform. For more information email sales@auroramm.com or visit www.auroramm.com.